With cold, snow and ice bearing down, winter presents some of the most dangerous weather conditions for seniors. Power outages, driving, snow removal, keeping warm, isolation, slips and falls all pose significant challenges and risks when mother nature unleashes her frosty fury. Here are 14 tips to keep you and your loved one's safe during the bitter winter months. If you're still driving, winter tires can make a huge difference to your safety on the road. Some jurisdictions, like the province of Quebec, have seen such a difference in road safety with winter tires, they've made them mandatory. You'll skid less, stop faster and make it up and down those hills effortlessly. Up to 90 percent of seasonal flu related deaths happen to people who are 65 and older. The winter is the most common time for the flu to hit North America. According to the CDC, the most effective way for older adults to protect themselves from the flu and its complications, like pneumonia, is to get an updated vaccine before each flu season, as recommended by your doctor. Despite our best intentions, our reflexes and processing speed decline as we age. When it's snowing it's harder for us to keep our focus while driving. When it's icy, it's harder for seniors to react and regain control when their car slips on icy roads. Our recommendation? Stay off the roads until it stops snowing and your city's had a chance to plow and lay down some salt and sand. An icy walkway or driveway is a big risk for falling. Have someone clear them for you when it snows and keep some salt around to clear it from any residual snow or ice. Nothing will ruin your winter wonderland faster than a fall on your behind. Winter falls breaks elbows, sprain wrists, tear shoulders, twist ankles and split heads. To help keep you upright consider wearing traction cleats over your boots. They'll make a world of difference and give you much more confidence to go about your day in the winter months. With shorter days and most of them spent indoors or covered up in heaps of clothing, our bodies don't get enough sunlight to produce the Vitamin D necessary to absorb enough calcium for bone strength. Brittle bones increase the odds that otherwise minor falls turn into major catastrophes resulting in fractured bones and hips. Discuss with your doctor. 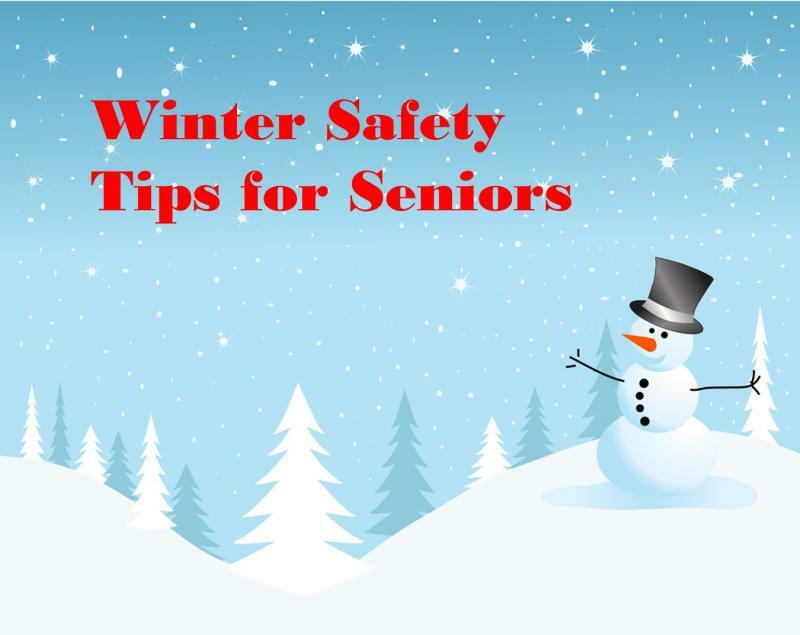 Whether during stormy or extreme cold conditions, some seniors will avoid going out. Check-up on them to make sure they have everything they need including food, medications and of course heat and hot water. Stop in and visit to make sure they're doing ok, aren't feeling isolated or depressed and are setting the heat properly. If you or your loved would prefer not going out in inclement weather, schedule deliveries of your groceries, prescription medications and pharmacy items. Maybe order in a dinner or two and enjoy a movie on Netflix! Many fires start in the winter months because of electric space heaters. If you're going to use one, make sure it's not next to any drapes, clothing, bedding or wires that can melt or catch fire. The CDC recommends you clear an area of 3 feet around a space heater to ensure safety. To prepare yourself for the winter, get your furnace serviced and make sure your chimney and wood stove are checked and cleaned by a qualified professional EVERY year. The last thing you need is for your furnace to break when you need it most, or for your chimney to cause a soot fire. If you're heating stops, turn your taps on slightly to prevent your pipes from freezing. Heating your home with a furnace, fireplace or wood stove all present carbon monoxide poisoning risks - the silent and odorless killer. Place carbon monoxide detectors in your main living areas, bedroom and furnace room. They're cheap, but absolutely essential. Extreme cold tends to increase the frequency of power outages. Make sure you have several flashlights in easily accessible areas such as your nightstand, kitchen counter or coffee table. Avoid candles at all costs! Open flames are dangerous and carrying them around with limited visibility is an even greater risk. In the event of an emergency, make sure you have the ability to call for help, even if the power goes out. In this day and age, where many households are cord cutting, this is especially important. You can do this by ensuring your cell phone is charged, you're wearing your life alert and your landline phone is on the hook. With lower blood circulation, seniors are particularly susceptible to frost bite and hypothermia in cold weather. Make sure your wearing a hat that covers your ears, insulated gloves, a warm jacket and a scarf to protect your neck and face from the cold. In inclement weather, you may be forced to wait for the bus or taxi a little longer. Be prepared. With winter comes extreme cold, ice and and snow - all challenges regardless of age, but especially to seniors. Preparation can avoid many of winter's biggest risks. Get your furnace, fireplace and wood stove checked in the fall, keep your walkway and driveway clear from snow and ice, buy proper winter clothing, get winter tires, eat well and you'll be able to enjoy the wonders of winter with a warm and cozy smile.